Do you desire to decorate and fit your home with quality products and appliances that reflect your value and lifestyle? A number of wolf products are available to fulfil this desire, ranging from clothes, paintings and art, jewellery, figurines, kitchenware, outdoor living to building products. As a discerning home owner, it is certain that you will be interested in only the best wolf products for use at home. It is important you acquaint yourself with adequate information on the best wolf products for the home available in the market. You also need to find out where to acquire them from. A good source of these products will have an array of categories to meet all the requirements that you, as the home owner, needs. 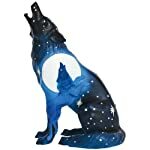 Using paintings and art wolf products to decorate the home is a statement in taste and style. You need to shop for wolf paintings and art items that best meets your individual expectation, in terms of both prices and quality. It is important that you be keen on the discounts on offer. 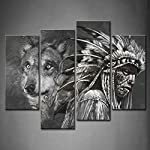 For example, you may want to consider the 4 panel Wall Art Black and White Wolf and Indians Picture print as is a great home décor decoration gift piece. These pieces are tasteful and pocket friendly. This is a great piece for the price. Other great painting and art pieces that will dazzle any home decorator include Wall Art Décor poster painting on canvas print and So Crazy Art 4 Piece Wall Art Painting. Your value for figurines will definitely rise when you understand the great influence that figurines have on the décor at your home. Chose a figurine that takes into account the skill and artwork appeal that you appreciate was put into the creation of that particular piece.You will be pleasantly surprised by the results. Good examples of magnificently wolf figurines are the Westland Giftware Call of the Wild, and the Call of the Grey Wolf. Both of the pieces are affordable and durable. In shopping for the best wolf products for the home, buying a good quality blanket will invariably come to mind. Blankets are used the world over as a fashion statement and as a covering to provide the wearer with warmth. Blankets are even more treasured if they provide comfort that is accompanied with an appeal that is both visual and tactile. The WPM Animal Print Queen blanket is one such blanket that has all the above qualities. Other wolf blankets that will definitely offer you with similar qualities are Super Soft Running Wolves Wolf Blanket Queen size, the Wolf Family Super Soft Polar Fleece Throw blanket and the Seven Hidden Wolves & Wildlife Polyester blanket. The world’s finest home decorators will attest to the fact that shopping for the best wolf products for the home can at times be confusing due to the wide range of products available in the market. 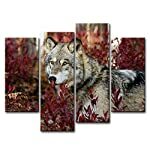 With our above selections and favorite picks, you can easily decorate your home in style and showcase your love and appreciation for wolves in a subtle and tasteful manner.